This provocative book posits a new theory of women's writing characterized by what Claire Raymond calls 'the posthumous voice. 'This suggestive term evokes the way that women's writing both forefronts and hides the author's implied body within and behind the written work. 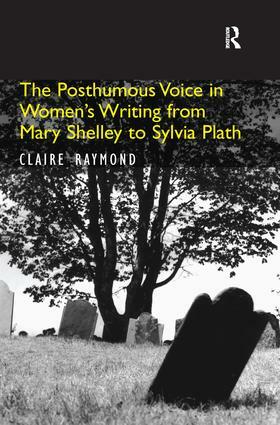 Tracing the use of the disembodied posthumous voice in fiction and poetry by Mary Shelley, Emily BrontÃ«, Emily Dickinson, and Sylvia Plath, Raymond's study sounds out the ways that the trope of the posthumous voice succeeds in negotiating the difficult cultural space between the concept of woman's body and the production of canonical literature. Arguing that the nineteenth-century cult of mourning opens to women's writing the possibility of a post-Romantic 'self-elegy,' Raymond explores how the woman writer's appropriation and alteration of elegiac conventions signifies and revises her disrupted relationship to audience. Theorizing the posthumous voice as a gesture by which the woman writer claims, and in some cases gains, canonicity, Raymond contends that the elegy posed as if written by a dead woman for herself both describes and subverts the woman writer's secondary status in the English canon. For the woman writer, the self-elegy permits access to a topos central to canonical literature, with the implementation of the trope of the posthumous voice marking a crucial site of woman's interaction with the English canon. Contents: Introduction; Spectral gardens: pastoral tradition and feminine self-elegy; Lethe's shore: Mary Shelley's sacred horror; Eating eternally deeper: the posthumous voice in Wuthering Heights; Emily Dickinson as the unnamed, buried child; Rossetti's late suitors: the death lyrics and the speaking body; Hooks and ladders: Sylvia Plath's 'The Rabbit Catcher'; Conclusion; Bibliography; Index. Dr Claire Raymond is an Independent Scholar from the USA.